Prior to their arrest, Ogunleye, Akinnibosun and Abraham put up at Otunba Oyedepo’s house (widely known as Villa), located in the GRA of Oro. 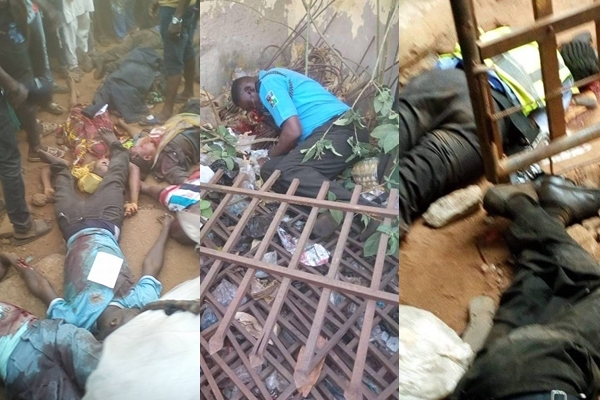 The suspects alongside 19 others were arrested last month for the prime roles they played in heinous act of April 5th which reportedly led to the death of 33 people including 9 policemen and pregnant women. However, after news broke that Arrow has been arrested in connection with the robbery incident, the elder sister of De Way, Yemisi Oyedepo otherwise known as Iya Sunbo was said to have evacuated friends and families of the suspects from her brother’s house before security agents from the Police headquarters, Ilorin, sealed up the building. Prior to his relocation to Canada about three years ago, De Way who had earlier taken a shot at the Kwara South Senatorial ticket, lived in the building with the suspects in addition to taken care of their upkeep. The duo of Akinnibosun and Ogunleye accompanied De Way to meetings and other public functions in the state and beyond ahead of 2011 and 2015 general elections. Speaking with our the press at the weekend, Asanlu of Oro, Chief Simeon Olayemi said three of the suspects are known in the community and they followed the politician each time he returns home from abroad. “Surprisingly, last week, another four suspects were paraded by the Nigerian police in Abuja, alas, linking their origin to Oro. We did our findings and we discovered that none of them is from our town. Speaking further, he said, it was after the arrest that the security agents sealed locked up De Way’s house while also putting surveillance over the building in place. When asked if the community has been able to inform De Way about the development, the high chief said, he is unable to get through to the politician saying he may have changed his mobile number after his return to Canada. Speaking further, he said, “I am disheartened and pained to the marrow each time I heard my town connected with robbery suspects. “People have been calling us all over the world that we should follow the case to the latter. Oro people are known all over the globe for being industrious in all areas and we are saddened by recent development,” he lamented. In the same vein, the National President of Oro Community, Chief Bode Alayoku, said, “Some of the suspects schooled in Oro, so they must have know the geography and nitty-gritty of the community”. He however urged the community to learn for the debacle by being vigilant each time there is any suspicious movements.